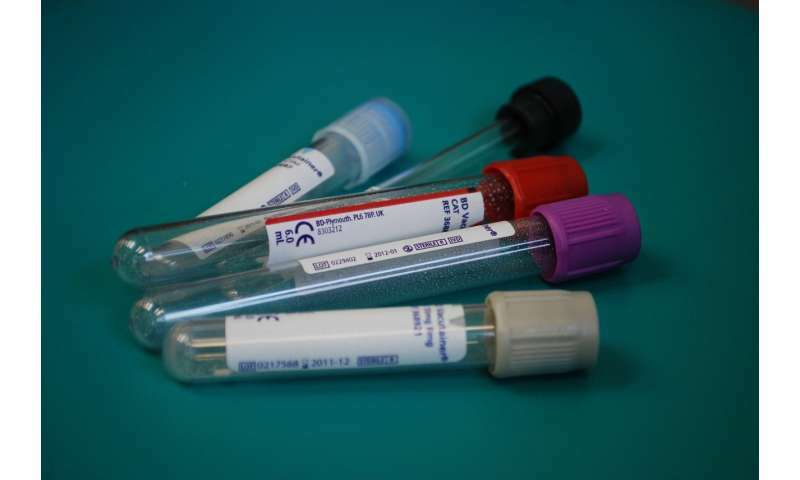 A team of researchers from the U.K., Denmark, Poland, the Netherlands and Switzerland has developed a new way to test for cancer—by looking at the size of tumor DNA fragments circulating in the bloodstream. In their paper published in the journal Science Translational Medicine, the group describes their technique and how well it worked when tested on patients with different kinds of cancer. Ellen Heitzer and Michael Speicher, with Medical University of Graz, offer a Focus piece on the work done by the team in the same journal issue. As Heitzer and Speicher note, human blood contains many small DNA fragments, most of them from white blood cells. But there are instances where other types are introduced, for instance, DNA from a fetus in the blood of pregnant women, or bits of DNA that break loose from cancerous tumors. In this new effort, the researchers discovered that DNA from tumors can be differentiated from other types of DNA in the blood by size—such fragments tend to be smaller than DNA fragments from other sources. To take advantage of this finding, the researchers carefully studied DNA fragments in the blood from several types of cancer and found they could be classified by size. They then created a new metric of measurement for them based on size. They called it trimmed median absolute deviation from copy number neutrality (t-MAD). The team then tested their approach by introducing DNA fragments into a blood sample and then used a benchtop fluidic device to focus on the DNA fragments, which they assigned a t-MAD rating. Pleased with their findings, they further tested their approach by conducting similar tests with blood from actual cancer patients. The researchers report that their testing showed the technique to be very reliable—it offered positive results for 94 percent of breast, bowel, ovary, skin and bile duct cancers with a false positive rate of just 2.5 percent. It also proved to be 65 percent accurate in detecting pancreas, kidney and brain cancers. Heitzer and Speicher point out that there are still some questions regarding the technique, however. Chief among them is whether testing will be as accurate when used in a large multicenter clinical setting.